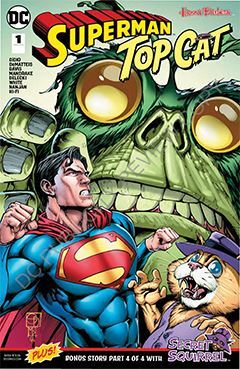 Superman goes toe-to-toe with the Kalien, a plant based creature whose people sought refuge on Earth back when kale was ignored as a food source due to its bitter taste. But now that’s changed, and Kaliens are being packaged by Wholesome Goods for consumption by trendy hipsters. Assisting the Man of Steel in this adventure is Top Cat, trapped on this world he never made after crossing the dimensional barrier from his own (See Adam Strange/Future Quest Special #1). T.C. is his usual conniving, con artist self, comparable to Sgt. Bilko or CPO Sharkey, but he knows things Superman needs. As the story winds down, it’s easy to foresee the customary “misunderstood monster” ploy, but what I failed to anticipate is a comic history reference point most fans should recognize. If you don’t, turn in your geek card. Also in this issue is a Secret Squirrel back-up feature, written by J.M. DeMatties. It’s chapter 4 of 4, running through the four DC-H/B comics released this week. I was subjected to Secret Squirrel in the pages of Scooby Apocalypse, which I didn’t enjoy so much. It seemed to run WAAAY too long, but if this holds to four chapters, I may sit down to read them all. I’m just in no rush.